We updated Hybridizer Essentials today. Finally we updated Hybridizer Samples to integrate those changes. Since the publication in parallelforall blog, we had 500 installations. We received both great and constructive feedbacks. The most important issue was the lack of CUDA 9.1 support. This is now done with version 1.1.5685.8524 of Hybridizer Essentials. You can download it from Visual Studio Marketplace or from our release page on our github. We also updated our SDK accordingly. We added four Visual Studio solutions, one for each Visual Studio version we support. Be aware that version 15.5.3 of Visual Studio breaks CUDA support (even 9.1). Keep version 15.5.2 (or below) if you want CUDA with Visual Studio 2017. We just released a demo app of fractals rendering. We hybridizer the same C# code in various flavors. We’re proud to announce the release of Hybridizer Essentials, a free Visual Studio extension. Hybridizer Essentials is a Visual Studio extension providing a full-featured Hybridizer for C#/CUDA. It allows you to write C# code, keeping focus on business logic, and letting Hybridizer generate the appropriate binary to run on the GPU. We also released a SDK on our public github. 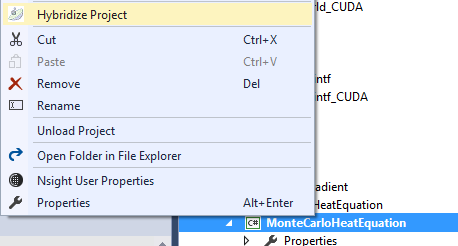 This SDK provides examples of code, ranging from simple hello world to a more complex generic heat equation solver using MonteCarlo.